This coming Sunday, we are dedicating R at church. She is not being baptized or anything like that. All a dedication means is that we are bringing her before our church to say that we will raise her to love the Lord and that we are recognizing that she is God's first and ours to hold on to for a little while. We pray that she will grow up to love Jesus and one day ask him to lead her life. At that point, she will choose for herself to be baptized. 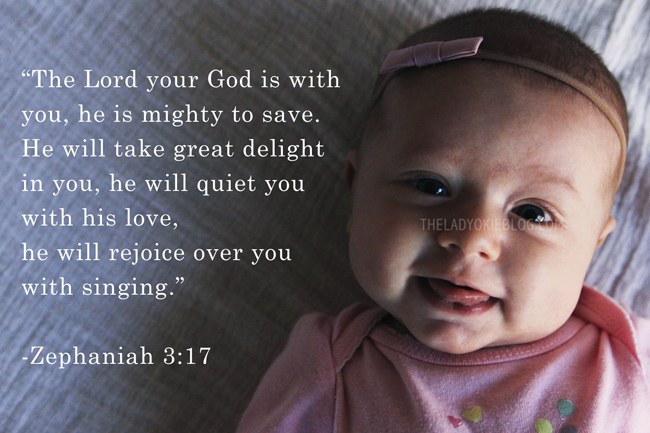 I love this verse because it is something we will be praying over her life. God loves R even more than we do (hard to imagine! ), and I know that he is rejoicing over her and that he takes great delight in her. And of course we take great delight in her as well and thank God every single day for this precious life he's given to us to raise. I also want you to know that no matter what you've done or what you believe or who you are, God takes great delight in you, and he rejoices over you with singing. I hope that gives you peace and brings you comfort like it does to me. I love that verse! It is so good and a great one to pray over R.
Did you know Rebecca Saint James has a really pretty song with that verse? You should you tube it. AND that little smile with the tongue sticking out is so so so cute! Beautiful and a perfect life verse! Thanks for sharing! Yes! I love picturing his love tangibly like that. It's really cool. I love that verse so much! We're dedicating Gracie a week from Sunday, and I'm so excited. Beautiful! Love the verse you chose for her! I love this verse so much. Enjoy Sunday. Baby dedications are always one of my favorite things. I love everything about this...and I'll be stalking your IG this weekend for photos from her dedication! I don't understand the difference between a baptism and a dedication, really. But then again I'm Catholic so I think Confirmation is our equivalent of non-infant baptism? I honestly don't know. But either way, I really like that verse. R is such a doll. I don't know much about confirmation, so I can't say. But I can see how they might appear to be the same because baptism and dedication and essentially the same idea. You are making a public confession of faith before the church. However, a baby dedication is the parents making that confession of faith before the church for us to say we are going to raise her in the Lord, and we are in a sense dedicating her to God, recognizing that she is His first. Baptism is the person making that confession of faith. This is why there was a split in Protestant denominations over infant baptism vs. adult baptism. My church (Southern Baptist NOT at all affiliated with those Southern Baptist nutters who protest everything; they aren't really Southern Baptist, but don't get me started) does not believe in infant baptism (nor do I, just to clarify). The baby doesn't know anything and can't obviously make that confession for themselves, so infant baptism doesn't make sense to me. When she's older, she will choose (or not choose) to get baptized. But there are some denominations that do infant baptism, and in my mind that's really more of a dedication because again, the baby is not deciding anything; it's the parents doing it. Obviously there's a lot more too all of that, but that's the gist. So if that wasn't horribly confusing, good job :) Basically you aren't wrong in saying they are similar, but they actually are different. What a beautiful verse! I love it. To follow up with your dedication/baptism vs baptism/confirmation convo - I grew up Presbyterian and was christened, which I believe is much like a dedication. My husband grew up Lutheran, and that is the church we have chosen to attend and possibly commit to. So our daughter was baptised and will go through confirmation. It is very similar then to the dedication/baptism route as Confirmation is an education in the religion and then she will choose to "confirm" our decision for her to be Christian and follow the Lord. So...it's basically all the same thing, just different names and timelines. I love the verse you selected. That is a great idea by the way! I have been to tons of baby dedications through the years (grew up Southern Baptist as well...and I know what you mean about those crazies - ugh! ), but I've never seen one where the parents select their own individual verses. I really love it. I know it will be a very special day for your family! Beautiful verse and great reminders! Happy dedication day to Miss R! I love that you did this. Dedication and birth blessings, I think, can be part of such an awesome spiritual heritage for a kid to grow up with. I've been told my whole life about how my grandpa prayer over me when I was born, that I would be like "Nathaniel, in whom there was no guile" and like "Martha, a hard worker." That's also a rather non-traditional blessing, but his blessing has meant much to me as I've grown into my own faith. So incredibly sweet!!! We picked a verse for Aiden too (Matthew 5:16) and I always refer to it. This will mean so much to her when she is older. *Cue the waterworks! That is a favorite scripture of mine! And I love baby dedication Sundays at our church. They are so precious! Oh wow, tears! Love that verse, and I haven't heard it in a while. This is so so so sweet! Our church does dedications, too, and I always love to hear the different verses the parents choose for their little one.